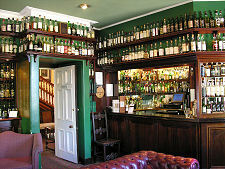 Craigellachie lies at the very heart of Speyside. This is the place where the two rivers most closely associated with the Scotch Whisky industry, the Spey and the Fiddich, meet. Craigellachie is built on and around the north facing bluff defined by the two river valleys. The name means rocky hill and was first applied to the cliff on which much of the village is sited, above the River Spey. 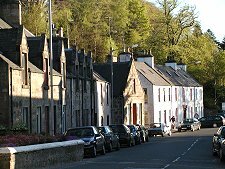 Craigellachie dates back to at least 1750, when there was a ferry across the Spey below where the village stands. 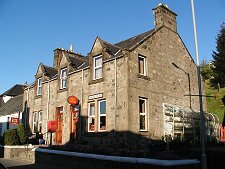 Parts of the village are very attractive: if there was a "Post Offices in Bloom" competition, then Craigellachie's, situated in the highly floral main street, would be a strong contender. 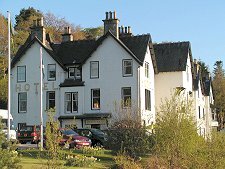 At the west end of the main street lies the imposing, white-painted Craigellachie Hotel. The grandeur of the hotel gives the lower part of the village an almost medieval air; as if the street were leading up to its castle. The effect is lessened if you approach from Dufftown, where the road coming over the bluff is cut into the hillside and actually passes behind the Craigellachie Hotel at a higher level. 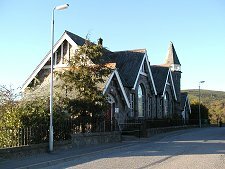 The upper areas of Craigellachie are more functional, though still with some fine buildings like the primary school. And here you will find one of Craigellachie's two distilleries, the appropriately named Craigellachie Distillery. This dates back to 1891, though much of what you see today was built in in 1965. 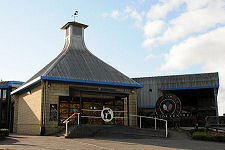 The distillery does not have a visitor centre. Craigellachie's second distillery is The Macallan, which does have a visitor centre. It is rather better known than Craigellachie Distillery; and its product is rather more easily found in shops and is highly rated as a single malt. 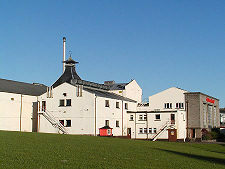 The Macallan distillery is found a little to the west of the village, on the other side of the River Spey. 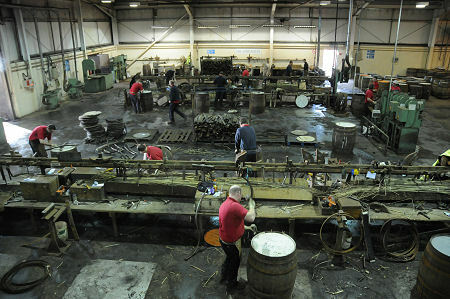 Outside Craigellachie on the Dufftown road is the Speyside Cooperage. Here 100,000 barrels a year are constructed or repaired, mainly for the distilleries of the area. Or, more accurately, many of them are reconstructed: much of the character of Scotch comes from the way it borrows something from whatever previously occupied the barrels in which it is matured, whether sherry, port, madeira, bourbon or whatever. Back in Craigellachie, it's worth the trip out of the village and across the busy A941 to find your way to the old bridge across the River Spey. There is parking near the bridge, down a minor road opposite the junction leading to the village. 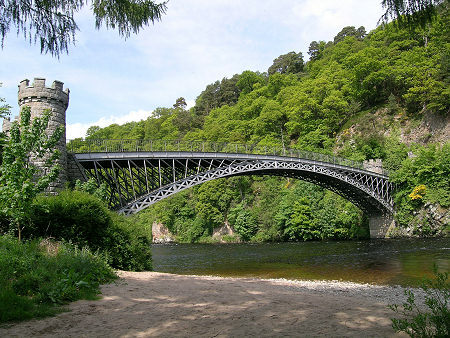 Craigellachie Bridge was built by Thomas Telford in 1814. A plaque on one of the castellated towers guarding the entrance to the bridge records that the metalwork was cast in Wales: another that the bridge was restored to something like its original condition in 1964. The bridge is a remarkable piece of engineering, and can be viewed from deck level or from the riverbank below. 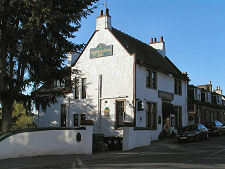 Craigellachie is an important stopping off point on the Speyside Way. This is the 65 mile long Long Distance Path from Aviemore in the south to Buckie in the north.